Comics Alliance has a great interview up with Ian Flynn and Vincent Lovallo talking about the final issue. A great many topics are discussed -- chief among those, reassurance that this is not *the end* for Mega Man. Check it out here. Hmm, when they first talked about this hiatus, they talked like they were planning on continuing the story right where they left off after the break was over. Now this new interview makes it sound more like what we'll be getting is something totally new. Archie is bleeding money all over the place, so they're trimming fat. The writing staff is probably backing off a little bit every day to try and get the comic to a point where corporate might think trying again is a good idea, a reboot is pretty much the comics last chance. In the alternative timeline alongside Star Force I assume? Since Classic exists in this one already, EXE cannot, I think? In an alternate timeline, along with Shooting Star Mega Man. But mostly under Viz's license, I think. Didn't knew about that. But didn't they appear in Super Smash Bros. as trophies and MM's special? Is there really a problem with those series like Strider? Might be that game rights remain with Capcom, but written rights are with Shogakukan. I know people hate the game, but I think it would be really cool if we saw Over-1 at the end of this helping Light with the time traveling problem so he gets back to his own time safely. Its also to bad they'll never be able to do the Challenger from the Future plot when the comic comes back, since just like Battle Network and Star Force its off limits due to not fully being owned by Capcom. I think the plot of that game is really neat and would work really well if done right in comic form. I hope hiatus means cancellation. Patrick should do himself a favor and leave that poor excuse of a sinking comic book company. Well I hope hiatus doesn't mean cancellation, because it's a thoroughly enjoyable comic and over the last 5 years one of the few new Mega Man things I got to look forward to. Or we could just be jaded fans that relish in its cancellation and then complain when we don't have anything. In the Mega man world, hiatus always means cancellation (the kidrobot figures are probably the only exception), even the D arts/SH figuarts line is gone. Hey, Prof. You forgot to log in. Okay I'll log in Cyberguy64, not like I can have an opinion without you popping out of nowhere labeling people because you don't like their opinion right? @Anon 4:38: That is your opinion and I respect it, but for me I can't stand the comic, it literally almost ruined the image of the characters I respected, Archie treats most of the robot cast like reject Badniks and it is just so.......... detached for lack of a better word from the games feel and representations of things the more and more it aligns with established stories and characters, demonstrated by their approach to the X series and it's characters (with the X crossover & worlds united). Nevermind all that, I just don't like the stories, writing style and world building of the comics. The art is sometimes alright but meh most of the time the Spaz covers and Bate interiors which are rare are the most quality of it all, the rest are either average or subpar and don't make up for the in my opinion cringe worthy story telling and character representations. I did however love the first four issues before Archie Archied it up. In fact the first four issues are nearly perfect and my personal ideal style for a Mega Man comic both artistically and in terms of story. And I respect your opinion of not liking the comic, I personally enjoy it, maybe not as much as the Ariga stuff, sure, but do you consider it so bad that its cancellation is actually a net positive for the franchise? I do agree with you regarding the Sonic crossovers. Not that I have anything against Sonic, but they do come across as campy and more of a cash grab. But hey, they sell well, so how can we fault Archie for running with them. At least they do them in a way that you can skip over them and continue with the standard Mega Man story if you want. I liked World's Collide, haven't ready any of World's Unite (I only do graphic novels so I'm a bit behind), but it looks a little too busy for my tastes. Well yeah, I mean I want to wish Mega Man all the riches and and positive popularity in the world, but not at the expense of its appeal and quality. I don't hate the idea of the comic continuing, but I feel it is too late to adapt it to suit my tastes as of now, that is why I would prefer it canceled and approached again from scratch in comic form. I wouldn't mind this specific comic getting better, I just don't see that as likely, so I'd rather it just finish its course. I too generally like Sonic, but what I hate is the crossovers not the individual series. "I did however love the first four issues before Archie Archied it up. 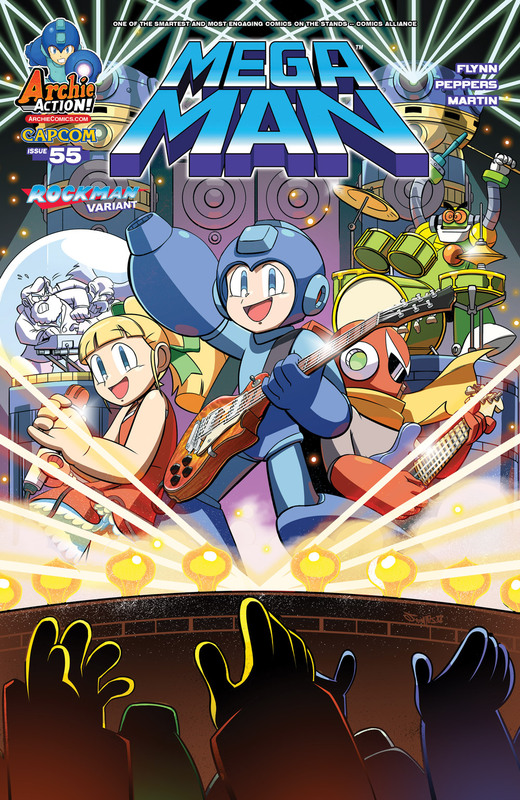 In fact the first four issues are nearly perfect and my personal ideal style for a Mega Man comic both artistically and in terms of story." It's funny you say that, because those first issues represent everything I hate about the comic's pacing. Spend three to five pages introducing a robot master then "kill" them. Follow the games' path to a fault, to the point you can almost predict Rock's every move. The rest of the comic is serviceable, but rushing through every game's plot verbatim kills it for me. That is fine that that kills it for you, but that is not what I meant. First off I'd like to get out the way that if each encounter and lead-up to a Robot Master and the corresponding battle was creative and well done with nice artwork, I personally wouldn't mind if the story followed the games' plot to the T. First off a simple story is not necessarily a bad one, a complex plot is not needed (IMO) to make an engaging action comic for kids, it doesn't need to be that deep, deep plots and twists here and there is ok but doesn't need to be the basis. Lastly that kind of style would set it apart from other Archie series while at the same time being true to the source material and attracting kids (and adults) that love action hero comics in a more simple form. That said, what I meant was the very professional approach to handling the characters and the feel/building for the world, the art and style of writing as in dialog etc not plot. Thing is it had to have some semblance of the source material to lead things off, I didn't expect it to just follow the Robot Master weakness patterns rinse&repeat that is ridiculous. What I didn't like is how they adapted the story not the very fact that they adapted it in the first place. I don't know. I don't think even Archie knows what they are saying at this point. They keep throwing the word hiatus around and it's a word I never want to hear again. How are they going to pick things up after this? I'm assuming this hiatus is going to last a good while. One rumor I hear people keep saying it's possible they are rebooting it for the "cartoon," but the thing is, how can you rework it to something that doesn't even exist yet and will not exist until 2017? Hell, it may never exist at all for a few reasons. It makes no sense. I want to be optimistic about this, but it's a little hard when there is no straight answer anymore. I mean, this isn't some top secret information from the government, it's a frigging comic! Sad to see it go, but I'm really excited to see Flynn doing a Legends story. MML's feel-good Saturday morning cartoon atmosphere is way more in-line with his style than X or even classic's melodrama. If by story you mean Legends characters showing up for two pages as a cameo, yes he's doing a Legends story. This comic always sort of seemed ill fated to me. The Sonic comic started back when the Sonic series was arguably at its peak and has been going ever since. This one, not so much. 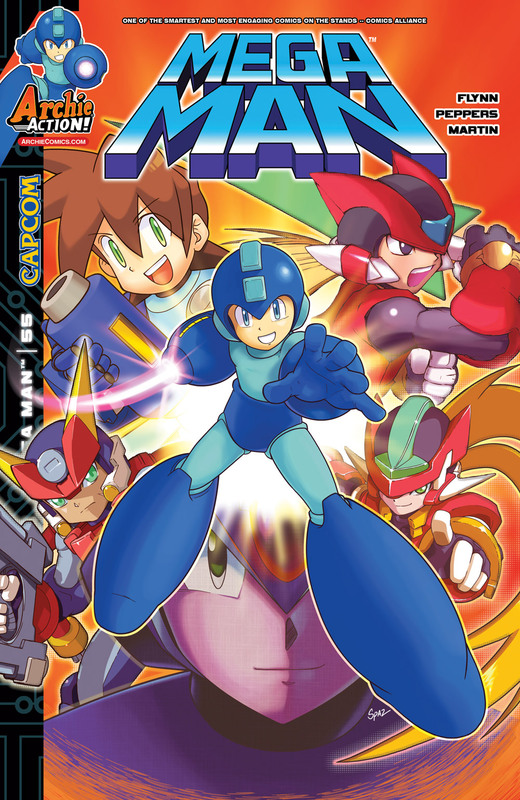 I'd love to see IDW get their hands on the Mega Man License... Street Fighter too. It was a nice ride but I lost interest as the time passed by. Volnutt's face looks kinda derpy. So the Aile / Grey timeline is correct it seems?